A luxurious boutique style hotel, which has retained its Victorian grandeur and majesty. Equipped with all modern necessities for both the comfort and convenience of the guests Roxford Lodge hotel is a very special place to stay. Roxford Lodge Hotel in Dublin is a boutique style hotel, offering luxury and style, located in the heart of Ballsbridge, Dublin 4, one of Dublin's most fashionable and exclusive areas. 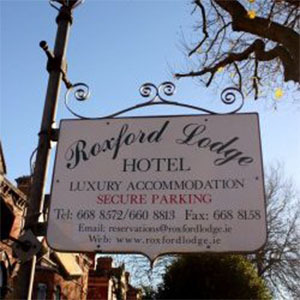 Roxford Lodge Hotel is elegant Victorian townhouse and it is within short walking distance of Dublin's city centre and all its main tourist, cultural and historical attractions such as Book of Kells, The Jameson Distillery, Christ Church Cathedral, The Chester Beatty Library and much more. Roxford Lodge Hotel is located within short distance from Dublin city centre's Temple Bar's nightlife venues, bars, cafes, traditional Irish music and dance places are just stone's throw away from us. At the Roxford Lodge Hotel, breakfast is our specialty. Guests can choose from a traditional Irish to a continental breakfast. We also cater for vegetarians and children. Our food is sourced locally where possible, and all of our breakfasts are home-cooked and freshly made. Roxford Lodge Hotel is an ideal Dublin city Hotel, the sport venues are just a few minutes from the Hotel, it is an excellent choice if you are attending a sport event in Aviva Stadium or Croke Park. All the rooms at the Roxford Lodge Hotel are individually designed and decorated, each with its own unique character. The rooms are stylish with every modern comfort in mind for both the business and leisure traveller.